The Gourmet Treatment. Our Gourmet Treatment basket is fit for a king! We fill it to overflowing with luscious, seasonal fresh fruit such as pineapple, mangoes, apples, oranges, bananas and grapes, and a fantastic selection of nuts, sausages, cheeses, sweets and treats. We try to include regional favorites, in each basket. The best regional wines are sought out as well, so that your Royal Gourmet Fruit and Wine Basket contains the finest available. Your choice of Chardonnay, Merlot, or both will complete this exquisite gift. 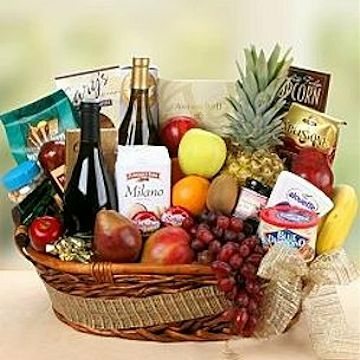 Exact basket and fruit selection may vary by season and delivery location.